I crammed my hands in the pockets of my jeans to keep them warm as I followed my brother along a narrow path that paralleled a creek. 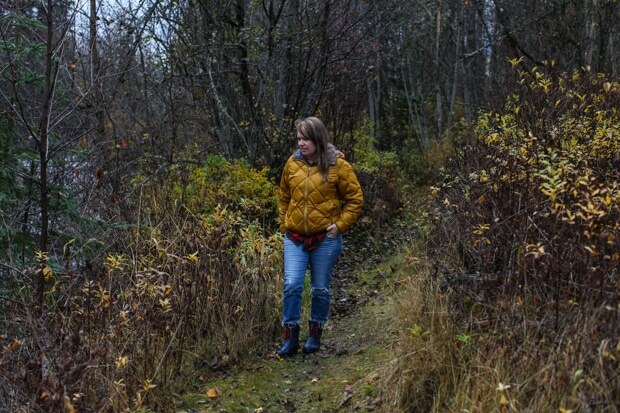 It was mid-October and the chill in the air confirmed that fall was well advanced in Northern British Columbia. The woods were vibrant with reds and oranges, one last festival of colour before Winter would wave her wand and transform the scene into a world of white. Josh and I walked over mossy logs and slippery leaves until the brambles of wild roses and clumps of willows parted to show the stream. 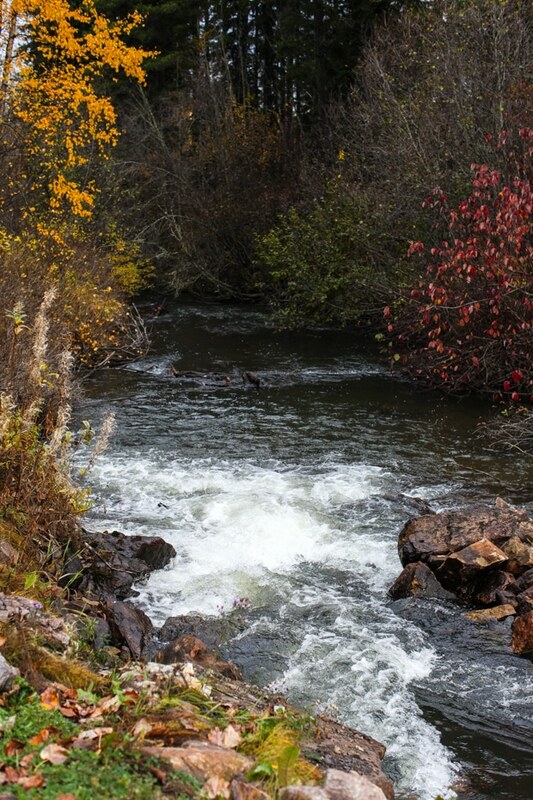 The water tumbled white, then quieted into a narrow creek bed lined with small, smooth stones. but my heart wasn’t there. I stepped down from the leaf-strewn riverbank and onto the gravel of the creek bed. The water lapped my boots, curiously flecked with crimson salmon roe floating among fallen leaves like tiny secret jewels. Groups of salmon rested in the shadows. At first we only spotted a few, then dozens. Below the rapids they pooled by the hundreds, each waiting their turn to leap. They had returned to their home creek from the sea; an absolutely staggering journey without rest or food, fighting the river all the way. 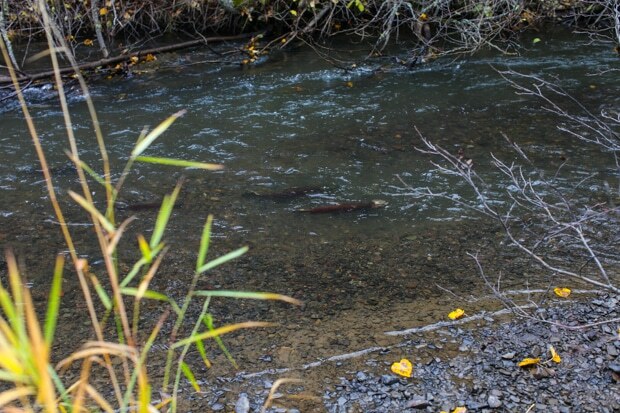 A pair of Coho salmon made their way within a few feet of where I stood and drifted in the shallows of the redd, almost like ghosts. The female flicked her tail back and forth to make a hole in the gravel; the male moved in closer. They were spawning, right there. With the scent of their birth creek only a distant memory, they had followed an urge to return home and begin a new cycle of life and I was witnessing the apex of their journey. As I caught a glimpse of my reflection in the water, my heart thudded under my down jacket. The scene was so utterly moving I blinked back tears and caught a ragged breath in the cold air. All day I had been feeling a similar pull: in the hugs of my nephew as he wrapped his chubby arms around my neck; the way my stomach flopped when I caught a glimpse of the Hudson Bay Mountain peeking through the morning fog; the scent of apples and hay, earth and pine; the sights, smells and feelings of home. Why had I waited five years to return? Why was I leaving again so quickly? I couldn’t even ask myself those questions for fear I would break down completely. What’s the point of questioning past decisions, anyway? Looking ahead with new resolution is how I renew each day, no matter how many mistakes the previous one held. The significance of watching the salmon return to their birth creek was not lost on me. I vowed to soon return with my family to the Valley where I spent my teen years. The longer I stayed away the less I remembered the beauty of the landscape, the warmth of the people. I wanted to remember it all afresh, and etch it in the memories of my children too. We’d stay a good long while, canoe down the rivers I paddled, hike the peaks I once scaled. We’d run through hayfields and hurl ourselves off lakeside docks. “To family. To coming home.” And to the salmon. Home is the scent of cedar and creek. Home is the journey’s end. Salmon and apples are paired in this delicately flavoured dish. Pour cider into a medium saucepan and bring to a boil. Add fennel seed, 1/2 teaspoon mustard seed, and 1/4 teaspoon pepper. Keep at a low boil for about 30 minutes or until cider has reduced into a sauce about the consistency of gravy. Strain cider reduction into a bowl and whisk in 1 Tablespoon of butter. Keep warm. Wash, core and slice both fennel and apple. Melt remaining butter in a large skillet and add the fennel and apple. Cook over medium heat, stirring occasionally, for 6-7 minutes. 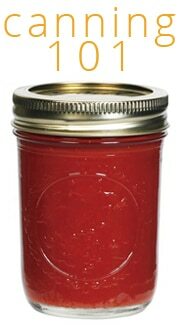 Produce should soften, but still retain a bit of crunch. Remove from heat and cool. Preheat oven to 350F. Line a rimmed baking tray with parchment paper. Using a sharp knife, slice salmon in half from top to tail. Lay it open like a book and brush both sides with a little of the cider reduction. Season it all over with salt and pepper. Place the side without the skin onto the parchment paper. Heap the sauteed apple and fennel onto the top and spread it out evenly. Top with the second piece of salmon, placing it skin side up. 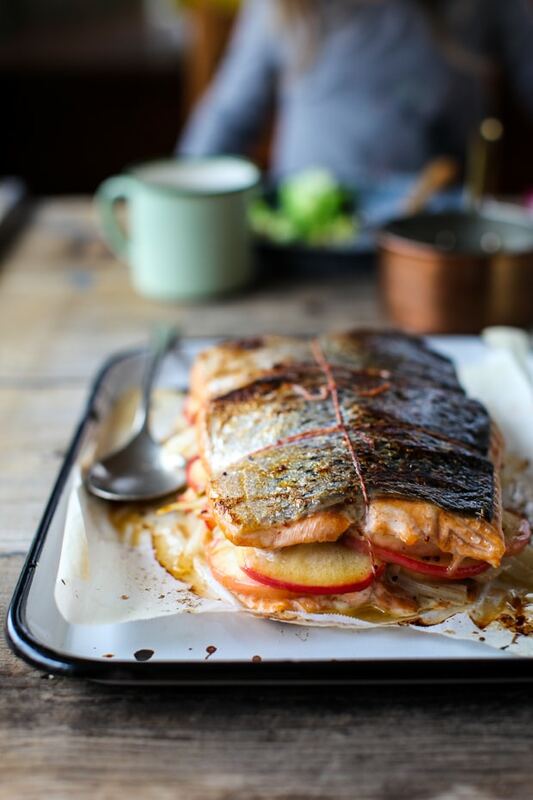 Wrap the stuffed salmon a few times with kitchen twine and place in the centre of the oven. Bake salmon for 20-25 minutes. Remove from oven, snip twine and serve at once with the cider glaze. 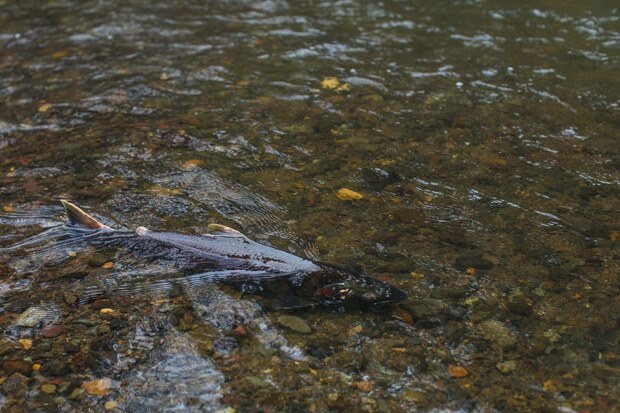 Write to government officials to let them know you are concerned about wild salmon. Go pesticide–free in your lawn and garden. Learn which seafood to buy, selecting items that are fished or farmed in ways that have less impact on the environment. Join the Pacific Streamkeepers Federation with your kids, stream and wetland care for volunteers of all ages. Pick up garbage or debris you find in streams or creeks. BONUS: Here are 10 ways for US readers to help save wild salmon. I love your post on salmon. The combination of memoir, natural history, conservation and healthy food — it just doesn’t get any better than this! I look forward to preparing this dish. Thanks for your excellent work. Aimee, I usually read your posts from my inbox, but this one touched me so that I had to leave a message. What a beautiful story relaying your past. I could feel how your heart has missed this part of your life. Thank you for bringing us down this road and introducing us to this beautiful part of your country. 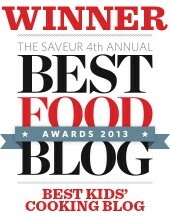 And the salmon, oh my… it’s on my menuplan for next week! This is such a heartfelt post. 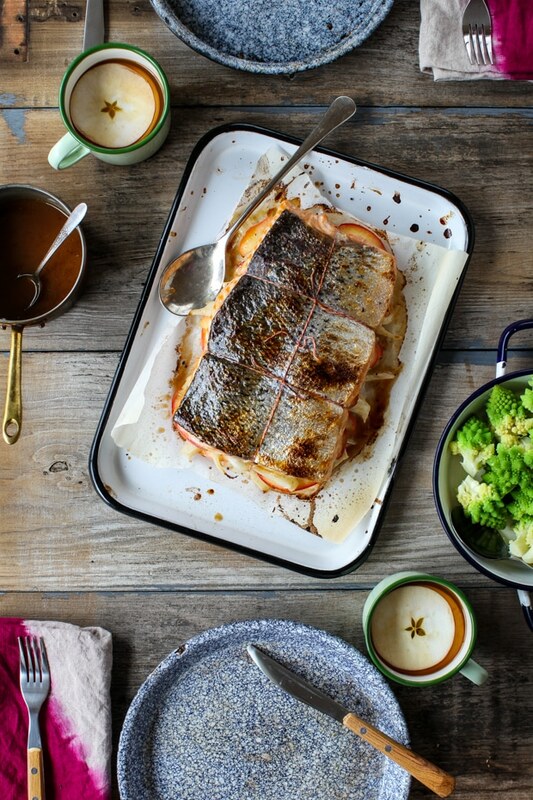 Loved reading this and this stuffed salmon looks amazing! Beautifully written! You have talent in the kitchen and with the written word. As I read your first post about your visit home with your brother, I wondered how difficult it must be to live so far away. It’s not only the beauty of the place but once again participating in activites from your past that must trigger a floodgate of memories and yearning for home and family. This post candidly confirms that it is so. Your recipe sounds like a delicious tribute to that visit. 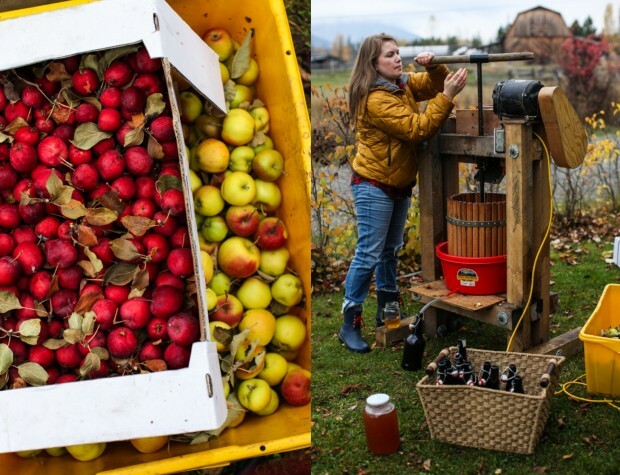 Making cider with an old-style press looks like so much fun! And the scenery! Gorgeous. Thanks for sharing your story. 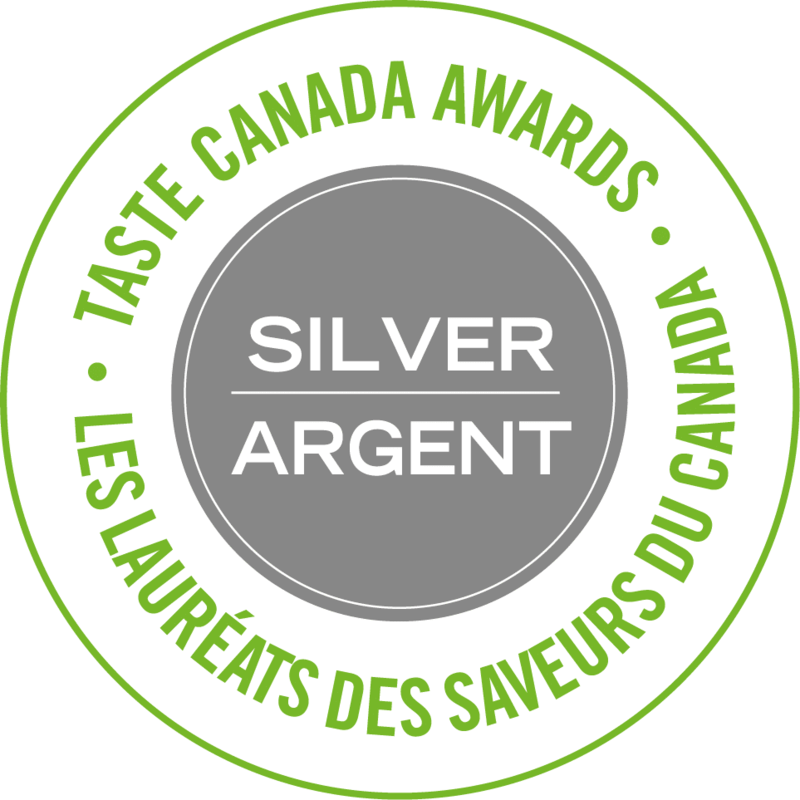 Wild salmon are definitely worth saving–and savouring. I’ve never had fish with fennel before, and so I simply must try your recipe. Wonderful post and the recipe looks great as well. I understand how you feel – when we were last in Minnesota, we were driving around the neighborhoods. The kids fell asleep, and I almost started to cry, thinking about how we live so far from our family, and how our kids are missing out on the experiences of long winters and true autumn and the anticipation of summer, not to mention all those family dinners. I know we’re making our own traditions here, but it still makes me very sad to think about not giving them the childhoods we had. It’s so interesting, because, our kids are happy, they’re not missing out on anything, yet we have this longing to have them catch a glimpse of our our childhoods. It good you guys go back once in a while. I live down the lane from the house I grew up in and I still feel a sense of wonder in the fact that my kids run through the same yards, hike the same trails and play in the same brook that I did as a child. That is so lovely, Bridget! This was such a beautiful post about home, food, family, warmth. I do not eat fish but love the naturalist part of your story and conservation ideas. Your photos are just stunning, as usual! Thanks for reading, Sarah. I’m delighted you enjoyed the post. So very good, Aimee, so very good. Each word. This post stirred my soul in a profound way. We are preparing to move to New England away from my homeland in the Southwest of the US. My heart breaks at the thought of leaving but thrills at the adventures ahead. I’ll be sure to not stay away too long and to share my beloved Sandia Mountains with my children and to hug on my sweet family that remains. Thank you for sharing the intimate moment of witness the apex of the salmon journey. What a beautiful thing to witness. Creation is magnificent. I’ve never regretted my move across the country, not for a minute, but I do wish I went home more often. Here’s wishing you the very best with the adventure that lies ahead. It sounds thrilling and very brave. Your post has an irresistible pull on my heart. I soaked up every word and photo. It was a splendid way to begin my day! I’m so glad you enjoyed it, Deb. Thank you for reading. This recipe looks so beautiful, delicious, and simple that I am changing my weekend menu right now! Beautiful post, Aimee. 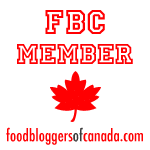 Beautiful post, beautiful photos, beautiful recipe! Thank you so much, Jennifer. It was a deeply personal post and I am so touched that it resonated with readers. I have tears in my eyes reading this, so beautiful. Those same feelings of returning home is what prompted a visit to my grandparents 60th anniversary reunion this summer. It was long travel days, solo parenting but it was worth for my girls to make a few memories in the places where I have so many memories, just a few hours north of where you were. Those pictures and those food ingredients stir such a deep nostalgia and gratefulness. Thanks for sharing. What a beautiful post and delicious looking recipe! I love the technique of slicing the salmon in half to stuff it. I also love that you are sharing ways to save wild salmon. So important! This makes me want to take the time to write well. So beautiful. I was right there with you, and I am totally choked up. Katie, thank you for reading and your kind comment. It means a lot. I went through a few tissues when I was writing it, that’s for sure. This was such a beautifully written, heartfelt and very touching post. 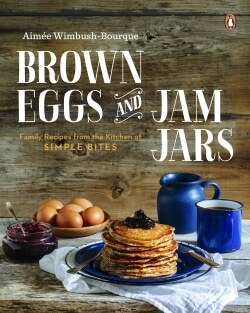 Thanks for sharing Aimée! The salmon recipes look amazing too! Barb – thanks so much! 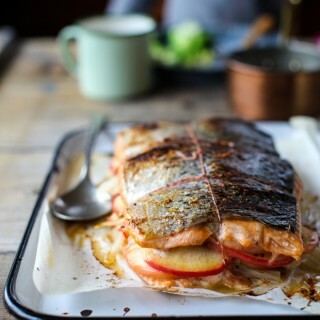 Great post, I love salmon and it is a regular staple in my household so the recipe is one i have to make. Gorgeous pics too! That means a lot, Marla, thank you! This post was lovely and it made me tear up. Thank you for sharing. I posted the US top 10 ways to save wild salmon on my Facebook this morning thank’s to you 🙂 And the recipe looks wonderful too. Oh thank you for sharing, Heather. It’s so important to raise awareness. Your girls would probably like the children’s book I linked to in the post: Salmon Creek. It’s SO good! Such a lovely and well written post. I’m so glad you shared it. Love the beautiful recipe as well. I love the way you write. It’s like a journey and taking me through your adventure. I would love some of this salmon on my dinner table! It looks absolutely delicious! 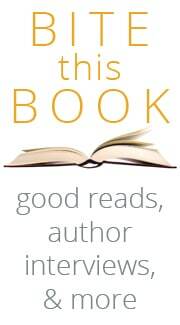 Aww, thanks for reading, Julie! So beautiful, Aimee. Thank you so much for sharing this. Cynthia, thanks for stopping by and for taking the time to read. So beautifully written. I felt that pull to come home and did move back years ago. Barbara, good for you. No regrets, I’m sure. Callie, welcome to my little corner of the web. Thank you so much for your encouraging comment! 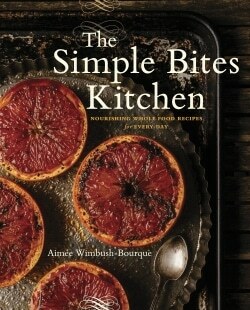 Inspirational writing as well as cooking. I would say good luck blogging your way to Kelowna but I don’t think you need it! Thanks so much, Alex. I appreciate the encouragement. I’m so glad you tried it out, Ausra. Thanks for the feedback.